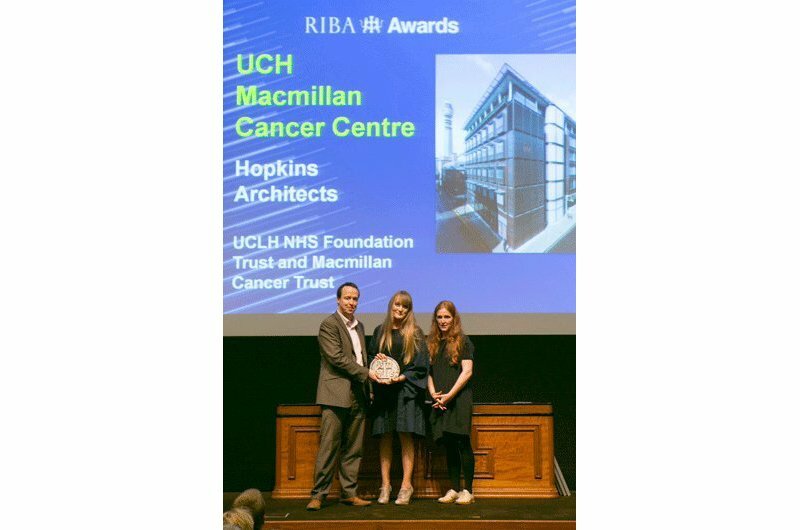 Hopkins Architects' University College Hospital Macmillan Cancer Centre has won a Royal Institute of British Architects (RIBA) National Award for Architecture as one of the best architectural projects completed in the past year. Judges praised the project as a "well judged building" that was "an excellent precedent for future healthcare." Additionally, UCLH won the RIBA London Client of the Year Award in recognition of their role as an outstanding client who contributed positively and effectively to the creation and delivery of the project. Located on Huntley Street in central London, the centre redefines the way patients are treated, focusing on all aspects of their outpatient care. Patients were involved in the design of the centre and its services every step of the way, from the light and airy entrance hall and uplifting colour scheme to the development of a web-hosted 'patient portal' which gives them more control over their care. The £100 million development has wellbeing, rehabilitation and cancer survivorship at the heart of its philosophy. This is supported by the very best diagnostic and treatment techniques to improve survival rates, including the UK's first PET MR scanner, delivering the most accurate information from deep inside the body during a single scanning session.